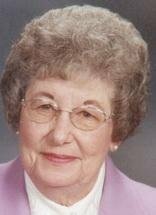 WATERLOO - Ruth E. Benedict, 84, of Waterloo, died Sunday, April 11, at Rosewood Estate. She was born Feb. 23, 1926, in Waterloo, daughter of Louis and Elizabeth Rhind Huggett. She married Forest Benedict on Feb. 23, 1946, in Waterloo. He died July 19, 1989. She graduated from Waterloo West High School in 1943. She was a secretary at Construction Machinery Co. for several years and later for Waterloo Mayor Leo Rooff for five years, retiring in 1981. She was a deacon at Westminster Presbyterian Church and a Cedar Valley Hospice volunteer. Survived by: two sons, Forest (Linda) of Baton Rouge, La., and Duane (Debbie) of Waterloo; four grandchildren, Jason (Carolyn), Dirk, Bethany (Shane) Schellhorn and Reilly; and six great-grandchildren, Cooper, Andrew, Ryan, Tyler, Shayla and Kainen. Preceded in death by: a sister, Claire Rule. Services: 2:30 p.m. Thursday at Katharine Graham Pahl Chapel at Waterloo Memorial Park Cemetery, with burial in the cemetery. Public visitation from 4 to 7 p.m. Wednesday at Locke Funeral Home. Memorials: may be directed to Westminster Presbyterian Church or Cedar Valley Hospice.